It is with mixed feelings (1 part ‘happy for her’ + 1 part ‘sad for us’) that we say “Happy Retirement” to a wonderful individual in our neighbourhood. 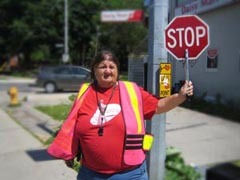 Crossing Guard Anne is leaving her post, (held for more than 30 years!) and moving on to her well-earned life of leisure. We bid a fond farewell and nothing but kind and warm wishes to go with you. With the hearfelt thanks of 3 generations of Trefranners…Happy Retirement Anne! You will be missed!